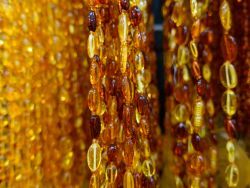 Since ancient times, Baltic amber, or the "gold of the North," has been used to make jewelry, perfumes, various ornamentation, and medicinal folk remedies, as it has long been touted for its analgesic and anti-oxidant properties. 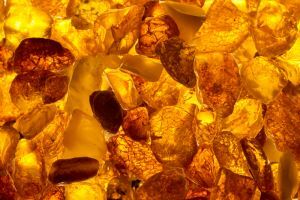 Considered by experts as the finest type of amber, it can range from bright yellow to brownish-orange, depending on its age and location of discovery; in rarer cases, the amber can be red, blue, green, or black. Rubbing produces an electrical charge, and burning the amber gives off a pleasant smell of pines. Baltic amber was formed over 45 million years ago from the resin produced by pine trees in the Baltic Sea region of Northern Europe, and its anti-inflammatory properties originate from the succinic acid that occurs naturally within the fossilized resin. Baltic amber is crafted today into pieces of medicinal jewelry, as body heat warms the resin and releases the succinic acid that is believed to help boost the immune system, heighten concentration, relieve pain, and reduce stress. Baltic amber bracelets are popular as a treatment for carpal tunnel syndrome, and you can even find teething necklaces made of Baltic amber for babies. Baltic amber is also the national gem of Lithuania, and prehistoric amber artifacts are found throughout the country, ranging in age from the New Stone Age to the Early Iron Age. The amber was used in ornamentation and ceremonial purposes, adorning both people and horses, weapons, cult symbols, amulets, crucifixes, rosaries, medallions, and more. At the end of the 19th century, large amber deposits were discovered in the Courish Lagoon that increased the growth of the amber industry in Lithuania. Amber commercial centers at Palanga and Klaipeda competed with Russia and Germany, nearly going under during World War I; the industry recovered during the period of Lithuanian independence from 1918 – 1939. 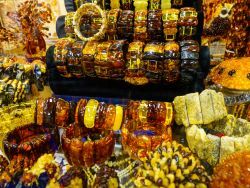 World War II posed another serious threat to the Lithuanian amber industry, but it recovered again and now produces over one million pounds of raw amber each year, over 90% of the world’s amber production. 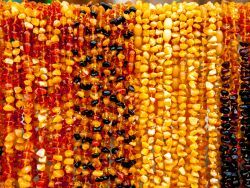 Only about 20% of this is of high enough quality to make fine jewelry, and pressed amber is made from good fragments and dust for the production of cheaper items such as costume jewelry and electrical insulation. Impure pieces of amber are used by chemical factories to produce amber oil, amber acid, and amber varnish.